Plans are being finalised for the visit to Somerset on Thursday (28 March) by Her Majesty The Queen. It is the first visit to Avon and Somerset by Her Majesty since her visit to the county in 2012, as part of the Jubilee Tour of the UK. Manor Farm Stables Yard in Ditcheat – where she will meet trainer Paul Nicolls and students from the University of Bath who are working on research projects on equestrian sport spinal injuries and racehorse welfare. Hauser and Wirth Gallery in Durslade Farm, Bruton, where The Queen will meet schoolchildren and an artist-in-residence. 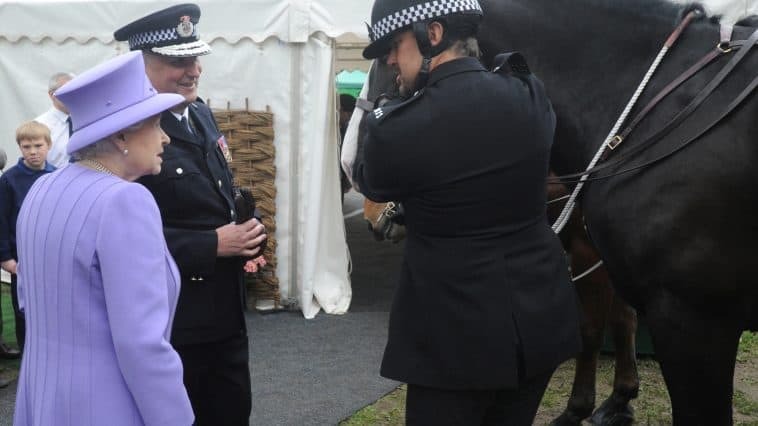 During the visit to the Kings Bruton School Her Majesty will meet members of Avon and Somerset Police’s mounted unit, where she will name a new police horse. She will also meet police horse Jubilee – the horse that she named during her 2012 visit to Yeovil during the Jubilee Tour of the UK. Avon and Somerset’s Chief Constable Andy Marsh and Police and Crime Commissioner Sue Mountstevens will be among a number of guests who will meet The Queen. Somerset County Council will be putting some crowd pedestrian barriers and coning in place for the visit. No parking will be permitted in the centre of Bruton during the visit. Anyone ignoring this is at risk of having their vehicle towed away. There may be slight delays as the Royal party moves from venues and those working and living in the area should plan accordingly. “This is likely to be one of the biggest events in the Somerset area for some time and we are sure the people of Somerset will give Her Majesty a warm welcome,” said Supt Hughes.